After the tragedy last week in Boston and the ensuing events, many in our country are gathering to mourn the loss of loved ones, the havoc wreaked in our streets, and the horror that two young people in our midst could commit such heinous crimes. During these difficult times, however, we have seen people demonstrate true humanity through acts of love and mercy, beginning with the first few moments after the attacks. In the next few days, people supported one another. An online guestbook was created for Martin Richard, the 8 year old boy who was killed. Muslim communities in Boston, MA, Joplin, MO, and elsewhere are planning interfaith vigils to cope with the tragedy through communal prayer and worship. People of all faiths from all over the world are offering support to the Islamic Society of Boston Cultural Center (ISBCC), located just a few blocks from where the attacks took place. ISBCC members have devoted significant time to emergency medical assistance, blood donations, counseling, and more. The Islamic Society of North America (ISNA) offered its members a way to assist with the healing process by creating the Boston Solidarity Fund, and encourages everyone to donate. The Muslim Public Affairs Council and the Council on American Islamic Relations also co-sponsored the fund. ISNA President Imam Mohamed Magid reminded everyone to donate to the fund at a press conference on Friday, when he applauded law enforcement officials for their hard work to identify and capture the suspects behind the attacks. Events like the one in Boston are a reminder that it is important for all of us to exercise caution to keep our communities safe. If you see something, say something — always be sure to report suspicious activity to the police or the Federal Bureau of Investigation (FBI). After a conference call with officials from the U.S. Department of Homeland Security (DHS) and the FBI, Muslim Advocates put together a helpful set of resources on keeping your communities and houses of worship safe. 1. Remain vigilant. Review all existing security measures including access control, perimeter barriers, communication and notification protocols, and monitoring & surveillance programs. Specific guidance on these topics, potential indicators of suspicious activity, and common vulnerabilities, can be found in the Infrastructure Protection Reports available for Religious Facilities and Schools. After reviewing these documents, you can contact your local DHS Protective Security Advisors to conduct specialized site visits and provide information and guidance on critical infrastructure issues at nicc@dhs.gov or (202) 282-9201. 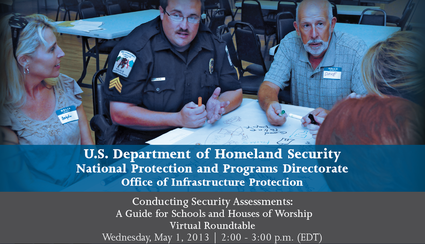 For specific guidance on conducting security assessments of your mosque, school, or other institution, consider joining a virtual roundtable hosted by DHS on Wednesday, May 11, at 2:00 p.m. Eastern. 2. Report suspicious behavior to local law enforcement. Call 911 to report an emergency situation. Consider reaching out to your local police department’s non-emergency line and your local FBI field office to discuss any particular security concerns you may have. If your group feels vulnerable or under threat, or if you need links to local law enforcement officials, please reach out to Haroon Azar, Regional Director for Strategic Engagement at the National Protection and Programs Directorate of the Department of Homeland Security, at haroon.azar@dhs.gov or (213) 978-0706. If you believe your community has been the victim of an attack due to its race, religion, or ethnic origin, Muslim Advocates asks that you contact them. They also urge community members to seek the advice of a lawyer when speaking with law enforcement and can provide you with a referral.